• Brand: Paderno World Cuisine (A498280R). 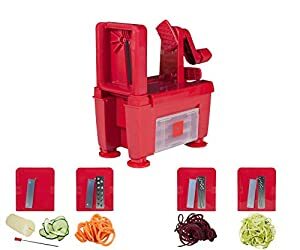 • Dishwasher-safe vegetable slicer/spiralizer kitchen set. • Made of heavy-duty BPA-free ABS plastic material. • Features six-blade spiralizer, two straight blades, three julienne blades. • Also includes cleaning brush and a recipe book..
• Suitable for Paleo, low-carb, high-protein, vegan and raw food diets..
• Overall Dimensions: 9.4 x 5.6 x 5.6 inches..